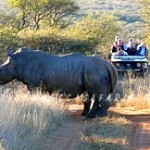 We look forward to planning your dream safari to South Africa. 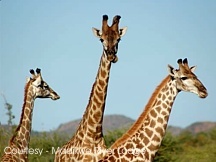 A luxurious and exclusive safari lodge, Makanyane is situated on private land within the magnificent 75,000 hectare malaria-free Madikwe Game Reserve – home to the Big 5 and a myriad of other animal and bird species. 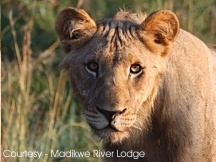 Makanyane, which lies hidden in lush riverside forest, offers unforgettable wildlife experiences, exquisite accommodation and cuisine as well as outstanding personal service. 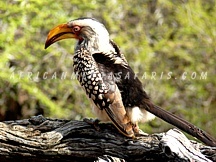 Visit Makanyane Safari Lodge to experience the drama and mystery of Africa’s vast natural history, exhilarating wildlife, ancient legends and rich cultural history and to relax and revitalise body and mind. Located on the edge of a ravine, Makanyane’s dramatic main lodge overlooks a stream-filled waterhole shaded by a dense canopy of trees. 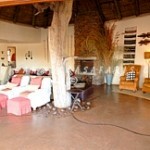 Enormous ancient Leadwood trees in the lounge and the dining room support the sweeping thatch roof. 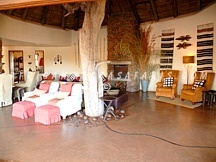 The spacious lounge area has two rock fireplaces and opens out onto a wide wooden deck hanging over the ravine and waterhole below. On this wooden deck is the well stocked bar with its sweeping roof. The gracious dining room also opens onto the vast deck area, perfect for enjoying a meal under the trees while watching game drink below. The main lodge has a curio shop where you can browse for souvenirs, a library area and an extensive wine cellar. 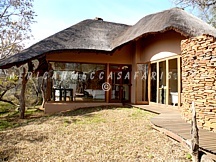 Upstairs is the air-conditioned den with a viewing deck, the elevated position providing panoramic views of the grasslands. Sweeping plains roll out towards the horizon, surrounded by a breathtaking skyline. 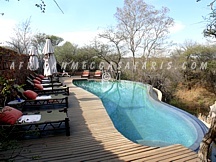 The secluded swimming pool is the ideal place to soak up the African sun, while enjoying the idyllic scenery. 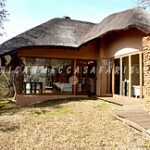 Close to the main lodge is the boma, an open air dining area enclosed by bush, reeds and trees. The boma is the perfect place to enjoy dinner next to a blazing fire. 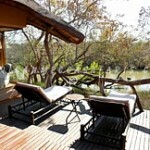 Sit back and enjoy the view out over the Marico River, the stars blinking through the canopy of leaves above you. 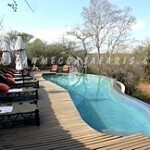 Not far from the main lodge, an isolated viewing deck stands on the edge of the plains. 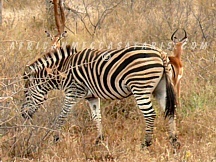 In this tranquil, tree shaded place, you can enjoy a quiet drink, while watching elephants stride through herds of waterbuck, zebra and impala grazing in these breathtaking grasslands. 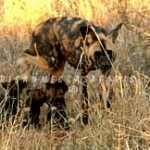 You may even see lion or cheetah moving through the grass, their vigilant stare searching for their next meal. Suites: A stroll along the shady path winding through the riverine forest will bring you to your romantic and secluded suite. 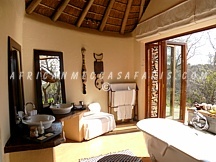 As in the main lodge, rich African textures abound, walls of natural rock and dried tree trunks merge with rough teak doors and contrast with the overhanging thatch. 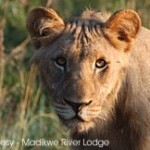 The glass walled bedroom suites allow uninterrupted views of the river and the surrounding bush. 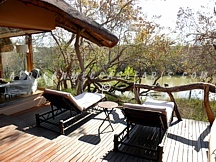 The open-fronted lounge with its private sundeck is the perfect place to relax and enjoy the sights and sounds of the bush. The call of the fish eagle echoes down the river as elephants, escaping the heat of the day, plunge into the deep water and disturb the sleeping hippo. 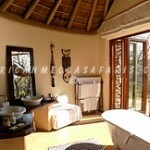 The spectacular bathrooms have under-floor heating as well as indoor and outdoor showers. The wide, folding doors can be opened to allow the sounds and scents of the surrounding bush to join you in the luxurious freestanding bathtub. The understated luxury of your suite flawlessly compliments your untamed surroundings. The suites have fireplaces, overhead fans and are fully air-conditioned and heated. The rooms also have a telephone, hot beverage making facilities, mini safe and a bar fridge. Bathrobes, hairdryers, insect repellent, body and sun lotion, soap as well as shampoo and conditioner are all provided. 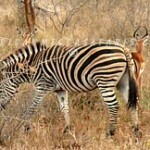 Gym & Spa: The well equipped gym and bush spa is just the place to work up an appetite, or to simply pamper yourself. Tucked away in the forest, th is air-conditioned facility has all that you need for a gentle workout or more strenuous exercise. Alternatively, treat yourself to massage or aromatherapy from Makanyane’s onsite masseuse. 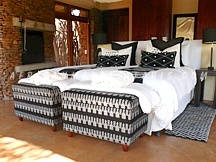 Look Outs & Hides: Rustic hides have been placed in certain idyllic locations on Makanyane’s private and exclusive land. 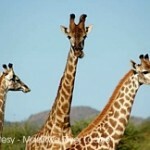 One of these hides overlooks a waterhole hidden deep in the bush, a favourite place for animals and birds to drink. Another looks over the vast plains, providing observers with an ever-changing view of animals moving across the breathtaking landscape. Those reluctant to surrender to the luxury of their suite can continue their African experience by sleeping out under a velvet canopy pierced with uncountable stars. To allow guests to experience the ambience of the bush at night, beds will be made up on the upper deck of a hide hidden deep in the bush, next to a waterhole. 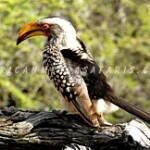 Our overnight hide brings you even closer to the sounds and experiences of the African bush at night. Makanyane prides itself on the exceptional quality of its food and wines, adding another memorable dimension to your stay with us. Meals are skilfully and imaginatively prepared by our executive chef, Mauritz Greeff, and his excellent team. Mauritz blends European and African flavours to create unique menus, using fresh local produce to create delicious and memorable dining experiences. Delicious cuisine is complimented by superb South African wines from our extensive cellar. As well as offering classic wines such as Kanonkop’s Paul Sauer and Klein Constantia’s Vin de Constance, we have gone to great lengths to search out excellent quality, value and range in the wine list that it offers to its guests. This ensures that for wine lovers Makanyane is a real treat. Relax at Indian Ocean Beach Islands of Zanzibar, Kenya, Mauritius, Seychelles. 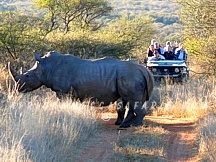 We look forward to planning your South Africa dream safari. 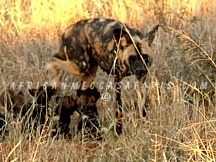 © Copyright by AfricanMecca South Africa. All rights reserved.